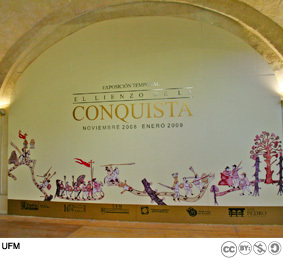 The Lienzo de Quauhquechollan exhibit can be designed to go anywhere in the world. Digital resources provide a high degree of flexibility; allowing the exhibition to be mounted quickly and easily in a wide range of settings. Our experienced staff will work with you to design an exhibition that meets your organization’s needs. San Pedro Museo de Arte, Puebla, Mexico. 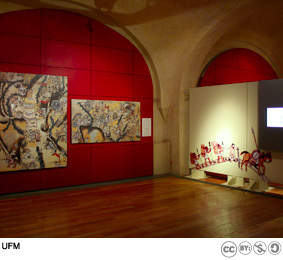 Exhibit of the digitally restored and original Lienzos. San Pedro Museo de Arte, Puebla, Mexico. 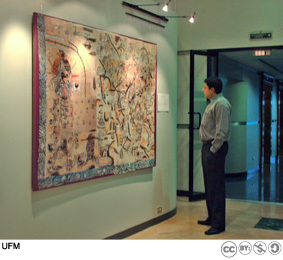 First international venue for the Lienzo exhibit. G&T Continental, Guatemala City. This month-long exhibit was free to the public. G&T Continental, Guatemala City. Exhibit was designed for the lobby of their headquarters. Casa Ibárgüen, Guatemala City. 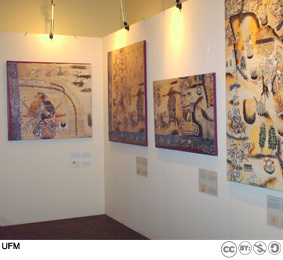 This exhibit was part of the 2008 Historical Downtown Festival. San Pedro Museo de Arte, Puebla, Mexico. November 2008–January 2009. Casa Ibárgüen, Guatemala City. 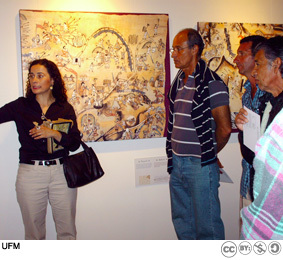 A member of the Lienzo research team (left) discusses the exhibit. Casa Ibárgüen, Guatemala City. 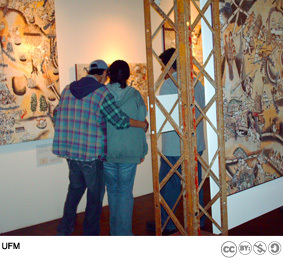 Flexible exhibits allow the Lienzo to be enjoyed at different events. There are many options for hanging and displaying the visual elements. Our designers can make recommendations depending on your venue’s needs and the resources available in the host city. The content of the exhibition is entirely digital, allowing the images to be printed wherever high-quality, large format printing is available. Color and design experts familiar with the project will ensure the final prints meet UFM’s standards. Printing in the host city eliminates expensive shipping costs and customs delays. All texts and audio are available in English or Spanish, or are bilingual. Ideally, preparations for a traveling exhibition should begin six months in advance. However, the flexibility of the design and the fact that the exhibition materials can be printed almost anywhere mean that an exhibit can be mounted faster if necessary. Traveling exhibits can be in place for any length of time. 10 ft. 6 in. x 8 ft. 5 in. (3.20 m x 2.45 m). Smaller sizes are available if space is limited. For each viewing station, you will need a plasma screen, speaker, and high-speed Internet access or a DVD player. The number of viewing stations will vary according to your venue’s design requirements and budget. For example, at UFM’s permanent exhibit, we have 7 stations; each has a plasma screen, a speaker, and a DVD player. 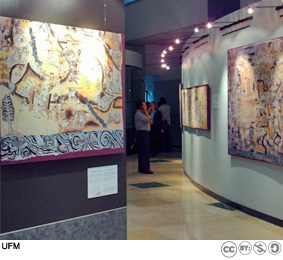 The temporary exhibit in Puebla, Mexico had 4 stations. 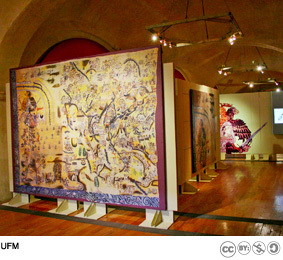 Large-scale interactive jigsaw puzzle for the floor that provides a view of Lienzo as it might have been displayed 500 years ago. The puzzle can be used as a learning tool by children as they play putting it back together. Bilingual exhibit catalogue, postcards, foldout guide, poster.